Why is my stress bucket full? Why did I walk into the Living Room for? STRESS…I can be one stressed out mamma at times. My husband tells me that I bring on most of my stress…sometimes I think he is right. 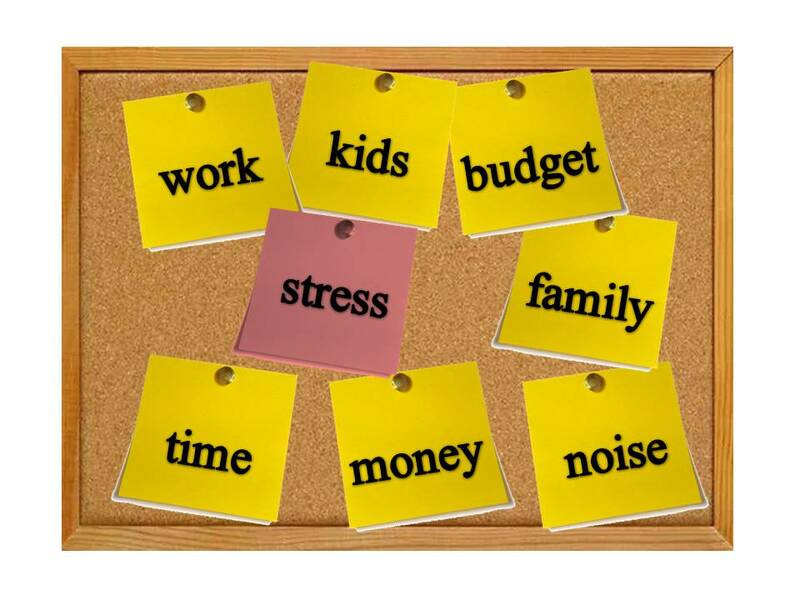 I really don’t have a stressful job outside the home, but it is within the walls of my home where stress meets me. Most of the time I have about seven kids running through the house. On top of my four kids, I watch my two nieces and nephew five nights a week, while their dad works. At times, my home seems to be like a circus. Surprised no one has tried swinging from the chandelier. But I have caught a few kids trying to slide down the banister. Stress can be good, that is when it motivates you. (Trying to meet those sale goals on time.) Stress can also be bad, when it is wearing you down. (House full of kids fighting.) What’s important is how you handle it. After searching the web and reflected on things in my own life; I was able to come up with 6 different ways to handle STRESS. When feeling a little anxious, just take a 5 minute break and breathe slowly and deeply. Slow breathes have been proven to help reduce the stress hormones in your body. Hey, we all need to breathe any ways. So give it a try. Nice and slowly. As a mom, you need to make time for you. It can be anything, from reading a new book, attending an art class, lunch date with a girlfriend, or starting a blog. Each week I have a few hours put the side that I call ME Time. I use that time to do something for myself. And that does not mean cleaning the house or grocery shopping. You need to do something for yourself. Journaling promotes reflection and organization of your thoughts. Your entries can be long or short, as longs as they are positive. Write about the achievements of your day, what you’re grateful for, the little things of life. There is a twofold with this Journal: One, its making you think and write down positive things. Two, you get to look back onto those little blessings God has given you. Did you know when you exercises it releases endorphins, which actually helps improve your mood and general well being of your body. You can start out small with a 10 minute walk during lunch, join a Zumba class, or even download the C25K app to your Smartphone. Whatever it may be, just get up and move. Lack of sleep can be the cause of many different health issues, included being a ‘Stressed out Mamma’. And face it; we moms just don’t get enough sleep. New born babies need to be feed every few hours, toddlers have a hard time sleeping in their own beds, and teenagers seem to miss their curfew. Regardless of what season of life you are in, moms just don’t get enough sleep. As a mom, you need to make sure that you are getting the sleep your body needs to function correctly. Did you know that spending time in the outdoors acts as a natural antidepressant? One of my favorite things to do is hike. I feel at peace, taking in the Creation of God. You might like to go fishing off the river, or walk the dog through the park or sunbathe in the back yard. Whatever it may be, spending more time outdoors will help lower your feeling of stress. Stress can be harmful to the body. When not dealt with it can cause headaches, upset stomach, high blood pressure, chest pain, and problems sleeping. As a mom, I want to be there for my family. Taking the right steps to taking care of me will be the key to being there for them. I would like to challenge my readers, as well as myself. Challenge you not to be a ‘stressed out mamma’. When you start to feel stress over take your body, ‘Stop, and Just Breathe’, ‘Take Time for Yourself’ or ‘Slow Down and Take in the Scenery.’ Any one of these is easy to do on the spot. Challenge you to say ‘No’. Before saying ‘yes’ to another event, to another project, to another something; look over your own calendar first. I noticed most of my stress comes from me over committing myself. I need to learn to say ‘no’. Challenge you to take care of yourself. When you fly on an airplane, the flight attendant will ask to put your oxygen mask on first, before helping others. Why is this so important? Because if you run out of oxygen, you can’t help anyone else with their oxygen mask. You need to make sure your oxygen mask is on first. Don’t let stress rule over your life.